We Mean Business > 26 D I V E R S I T Y W O M A N S u m m e r 2 0 1 7 d i v e r s i t y w o m a n . c o m more than important for professionals to be strategic and smart in asking for and get- ting adequate compensation, and women literally can't afford to leave money on the table. Neglecting to be deliberate in efforts to get your just due can cause a negative snowball effect and can lead to burnout, underemployment, and even financial dif- ficulties. Here are eight tips for swaying your performance review in your favor and acing raise negotiations. 1 Do your research. It isn't just about how you feel or what you believe you deserve. It's about having solid informa- tion on the market value of your skills and job title. "Find out the going rate for your job position in your area on sites like Glassdoor.com and take into consider- ation any perks the company offers you, says Hallie Crawford, a certified career coach and founder of HallieCrawford. com, a digital platform for career ad- vancement and coaching services. 2 Determine the best time to make the request. If the position is a new opportunity, Crawford suggests initiat- ing salary negotiations close to or at the time of the job offer. If you've been at the job for a while and want to get a raise or promotion, try to time your meeting to coincide with key transitions. 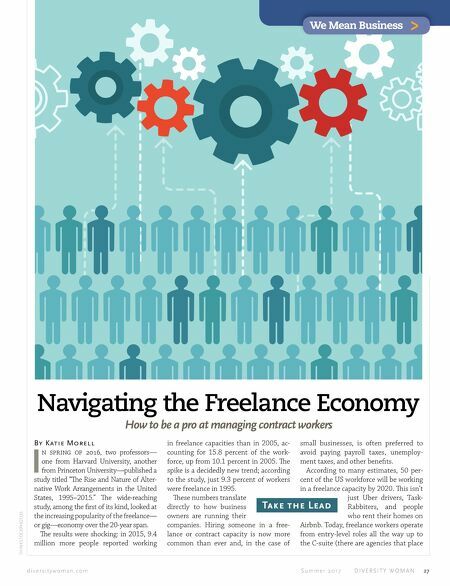 "If some- thing has happened to change things in your current position—a change in job title, the addition of new responsibilities, a company merger—that is an acceptable time to negotiate your salary or job re- sponsibilities," Crawford says. 3 Practice your approach before spark- ing the negotiation conversation. "Have a pregame plan in mind," says Sa- lemi. "Figure out ahead of time what you will ask for and how much you want." ink about the ideal compensation for your lifestyle and your financial goals, and write down these details. en get advice. "Go through your pitch with a trusted friend or mentor, and ask her what she thinks," Crawford advises. "Be open when suggestions are offered." Get- ting the support of someone who has been successful in her career climb is helpful in shaking off those negotiation jitters as well. 4 Prioritize what's important. "Always go for salary first, then sign-on bo- nus, then all the perks," Salemi says. "e most successful negotiations I've seen don't occur when someone asks for the sun, moon, and stars. It's important to prioritize." 5 Be realistic in your expectations. "Before you go into the meeting, even if you have a dream number in mind, de- cide how much you can realistically live with, and be happy [even] if the nego- tiations don't go exactly how you want," Crawford says. Also, be prepared with a counter-request if your initial ask was not adequate. Use data to negotiate. Ask if the company can revisit the numbers be- cause, based on your research, the going rate for someone with your level of skills and experience is X dollars. 6 Share your accomplishments and include tangible metrics. If you're already on the job, draft a log that il- lustrates your value and skills as an em- ployee. "All professionals should have one," says Crawford. Get the feedback you need by asking specific questions about your performance and how you might improve, and include things in your log like successful projects you've worked on; specifics on how you've helped increase efficiencies, improve workflows, or boost profits; and notes on other accomplish- ments that show your value and make a case for that raise or promotion. 7 If you can't get a raise, negotiate oth- er perks. "e easiest one to get green- lit is additional time off," Salemi says. "Fig- ure out in advance how much you're asking for, such as one workweek or seven days. "You can also negotiate getting a more substantial title, day-care services, better health insurance options, freedom to work from home, education resources, or a more flexible work schedule. Sometimes it's not just about money in your pocket, but more about money-saving options or future ca- reer-advancement tools that the company might feasibly be able to give you. 8 Know when to walk away—whether for now or for good. If you're a new job candidate who was just given an offer, be aware of indicators that the company or job is—or isn't—the right fit for you. "is is your future employer," Salemi says. "Are they treating you respectfully and acknowledging your right to ask for more, or are they making this a stressful situation, almost as if they're reprimand- ing you like, 'She should be happy enough to work for us!' Pay attention to red flags, and remember, it's OK to walk away." 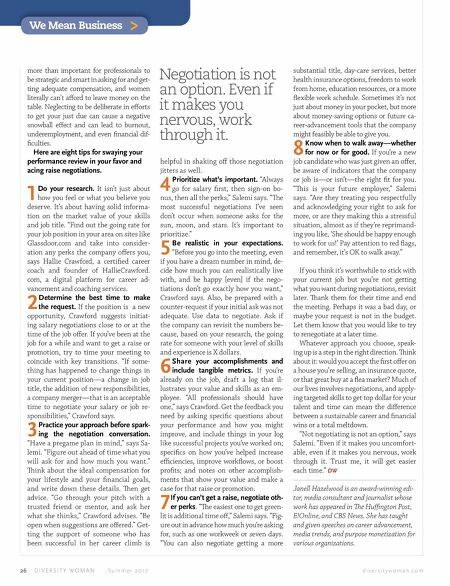 If you think it's worthwhile to stick with your current job but you're not getting what you want during negotiations, revisit later. ank them for their time and end the meeting. Perhaps it was a bad day, or maybe your request is not in the budget. Let them know that you would like to try to renegotiate at a later time. Whatever approach you choose, speak- ing up is a step in the right direction. ink about it: would you accept the first offer on a house you're selling, an insurance quote, or that great buy at a flea market? Much of our lives involves negotiations, and apply- ing targeted skills to get top dollar for your talent and time can mean the difference between a sustainable career and financial wins or a total meltdown. "Not negotiating is not an option," says Salemi. "Even if it makes you uncomfort- able, even if it makes you nervous, work through it. Trust me, it will get easier each time." DW Janell Hazelwood is an award-winning edi- tor, media consultant and journalist whose work has appeared in e Huffington Post, E!Online, and CBS News. She has taught and given speeches on career advancement, media trends, and purpose monetization for various organizations. Negotiation is not an option. Even if it makes you nervous, work through it.